The recently concluded Candidates Chess tournament was easily the most exciting and dramatic since the 2013 edition. Several players were in contention to win the tournament till the very end, and it was anyone’s guess who would emerge victorious. In the end, GM Fabiano Caruana deservingly triumphed, winning his last game as Black against Grischuk to seal the deal in style. The real fun starts for him now, as he faces the gargantuan task of challenging the reigning World Champion, GM Magnus Carlsen, for the ultimate chess title. GM Fabiano Caruana - The winner of the tournament was also the steadiest player, as he converted most of his chances while rarely getting into trouble himself. He suffered only one loss, to GM Sergey Karjakin in the 12th round. But it wasn't even a loss where he played terribly or anything. Simply put, Sergey played brilliantly and demonstrated a deeper understanding of the position. That happens in chess, even to an elite player like Fabiano, and sometimes you just have to tip your cap. The loss came at the worst possible time, however. Fabiano had been leading the event from the very start, and suddenly he had lost that luxury of being at least 1/2 point ahead of his nearest rival. Most people would have been unable to recover from such a psychological blow, but Fabiano displayed a champion's character by rebounding in the very next round itself to defeat GM Levon Aronian, which allowed him to regain the sole lead with a round to go. A lot of people have jumped on the Fabiano bandwagon after this tournament, but it's funny to note that not many people picked him to win the tournament at the start. This was probably influenced by his performance in Wijk an Zee, where he finished an abysmal (by his standards) -3, dropping ~25 FIDE points in the process. But Fabiano is probably the most consistent player after Magnus, and so it should have been expected that he would revert to his usual good form at the Candidates. GM Sergey Karjakin - Another incredible performance in the Candidates by Sergey, who won the last edition. After losing in Round 1 as White to Mamedyarov, and then again as White in Round 4 to Aronian, everyone had pretty much written him off. At 1/4, it seemed like it was a question of whether he would finish last or not. But Sergey showed why he's considered to be one of the most resilient and mentally strong players, and began a comeback for the ages. He scored an astonishing 6 points out of his next 8 games, 4 wins and 4 draws, catapulting him into tied 1st with Fabiano. He even had the h2h tiebreaker, and momentum was on his side. Unfortunately for Sergey, his blistering pace came to an anti-climatic halt, as he could only manage 2 draws in the final 2 rounds. Still, to finish tied 2nd place after the start he had is truly amazing. If he had not uncharacteristically lost twice as White in the beginning, we would be seeing a Carlsen-Karjakin rematch. GM Shakhriyar Mamedyarov - Shak was my pre-tournament pick to win the Candidates. I thought his new style of playing, pragmatism combined with playing more "solid" and "classical chess," would help lift him over the hump. Well, I was close! He had an ideal start to the tournament, winning his first game as Black against Karjakin. A couple of draws were then followed by another win in Round 6, over Kramnik, putting him at +2 and tied for first with 8 rounds to go. However, Shaq was unable to separate himself from the pack and ended up drawing his next 6 games. There were only 3 rounds left, and, desperately needing a win, he went all out against GM Ding Liren in Round 12. His overambition backfired, however, as Ding cooly fended off Shaq's initiative and handed him his first loss. He managed to get back to +2 with a win over Grischuk in the penultimate round, but a draw in the final round against Kramnik ended any hopes he had of winning the tournament. As it turned out, it wouldn't have mattered anyway as Caruana ended up winning his game. GM Ding Liren - The #1 Chinese player has been part of the World's top 15 for quite some time now, and yet invitations to the elite tournaments have eluded him. Not this time, however, as he guaranteed his spot in the Candidates by reaching the Finals of the 2017 World Cup. The general consensus was that Ding would be unable to contend as he didn't possess the requisite experience at high-level tournaments. Yet he surprised everyone by not only contending for the top ranks but by being the only undefeated player in the entire tournament. 13 draws, and 1 win. His path to an unblemished record was far from smooth, though, as he was lost in a few games but managed to hold through extreme tenacity and defensive skills. An impressive Candidates debut! As of now, Ding is currently #5 in the world and so invitations to elite tournaments shall be plentiful now. Looking forward to seeing how he consistently handles himself against the best players in the world. GM Vladimir Kramnik - This tournament was regarded by many to be Kramnik's "swan song" to the Candidates, as it would be tough to envision him qualifying for future editions due to his age. After all, chess is becoming younger and younger, as evidenced by the fact that the top average age of the top 10 players in the world is only ~26. Vlady dispelled any notion that he was going to "roll over and die", though, and came to the tournament armed with a plethora of novel opening ideas. His preparation paid immediate dividends, as he won 2 of his first 3 games to jump out to a red-hot 2.5/3 start. 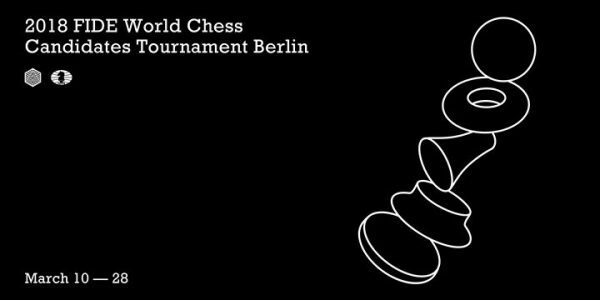 In the 3rd round win over Aronian, he introduced an amazing novelty in the Anti-Berlin which essentially refutes the variation that White played. His Round 4 game against Caruana turned out to be a fateful one, however. What started off as a relatively tame Qe2 Petroff turned into a maze of complications. Caruana seemed to have things under control when suddenly a series of inaccuracies tilted the advantage in Kramnik's favor. The position still remained incredibly complicated, though, and it was Kramnik who collapsed under the extreme pressure of the position. It was an extremely demoralizing loss for him, and he was unable to recover after that, finishing tied 5th. One other thing I should mention about Kramnik was the constant over-estimation of his positions. This mentality of extreme-over ambition and trying to play for a win even when the position did not justify it led to him becoming highly unobjective, and unnecessarily losing several games. GM Alexander Grischuk - Sasha finally made his way back into the Candidates, much to the delight of chess fans. Unfortunately, he'll be remembered more for his entertaining actions off the board than on it, as he finished with an underwhelming -1 and tied 5th with Kramnik. Still, he did enthrall us with several exciting games, even if it did not always work out for him. It's good to see Sasha back in elite tournaments, and I hope this continues. GM Wesley So - Wesley finished a disappointing -2, which placed him in second last. In my opinion, it was a result of being not as well supported as the other players, who all had their personal team of seconds and coaches. It's a testament to the talent Wesley is that despite not having these resources, he has solidified himself as a true top 10 player and managed to qualify for the Candidates. I hope he can find the help he deserves, and fully expect him to bounce back in the coming tournaments. GM Levon Aronian - Perhaps the most shocking result of the tournament was Aronian finishing in last. Levon has always been a trendy pick to win the Candidates, and this time was no different as he was considered by many to be the clear favorite to win it all. In the past, Levon had been unable to maintain the intensity that is required to win the Candidates. But people believed it would be different this time as he proved that he could perform well in high-pressure tournaments by winning the 2017 World Cup, becoming the first player in history to win it twice. Unfortunately, things never got going for Levon and he was the only player not to win a game, finishing with 8 draws and 5 losses. Levon is well known to be an extremely uncompromising player, and his bad form coupled with over-ambition led to him losing some games he otherwise would not have lost. Quite similar to Kramnik, I'd say. I hope he does not lose his confidence and ambition to become World Champion, as the chess world is much more exciting when Levon is firing on all cylinders. In the next post, I will delve into some of the best and worst moments from the games in the Candidates.